It’s a little late, but life gets in the way! I made these cookies about a week ago and I felt the need to share. I have the smallest fridge. Well, small for an apartment. It’s not a full size and it’s a few inches taller than I am. I’m 5’4″ so that’s not saying much. This means that when food goes on sale I can’t buy as much as I would like for the freezer, it also means that I have precious real estate going on. I had gotten to the point where I knew that I wanted Halo Top in my freezer more than I wanted veggies. I’ve been buying my veggies fresh and consuming them relatively fast, so the frozen veggies needed to go. I also buy a lot of blueberries and strawberries when they go on sale for BOGO and throw them in the freezer. Needless to say there were a lot. I knew the broccoli would be steamed and eaten, no problem. But strawberries on the other hand can be tricky. After being frozen they can get mushy during the thawing process, which isn’t appealing usually except in a smoothie. My goal was to find a recipe that used strawberries in a way that mushy ones wouldn’t be a problem. 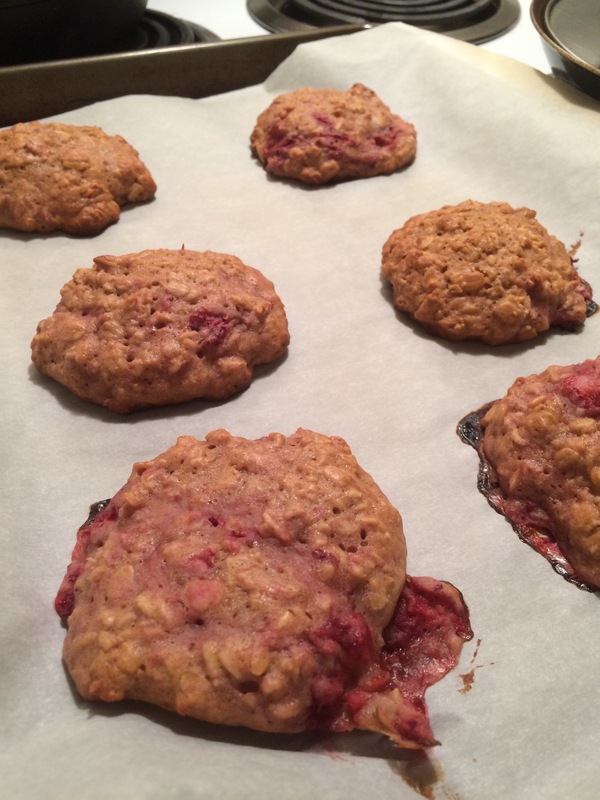 As I was surfing Pinterest I came across a pin for Strawberry Oat Cookies. I may have also added “healthy” into the search bar. Don’t be fooled, these aren’t super healthy, but they aren’t super awful either. These use oats, which are a good source of fiber. The recipe called for honey and coconut oil. Honey is a more natural sweetener than that white powdery stuff and coconut oil has healthy fats in it. Still fatty, but a little better than butter. 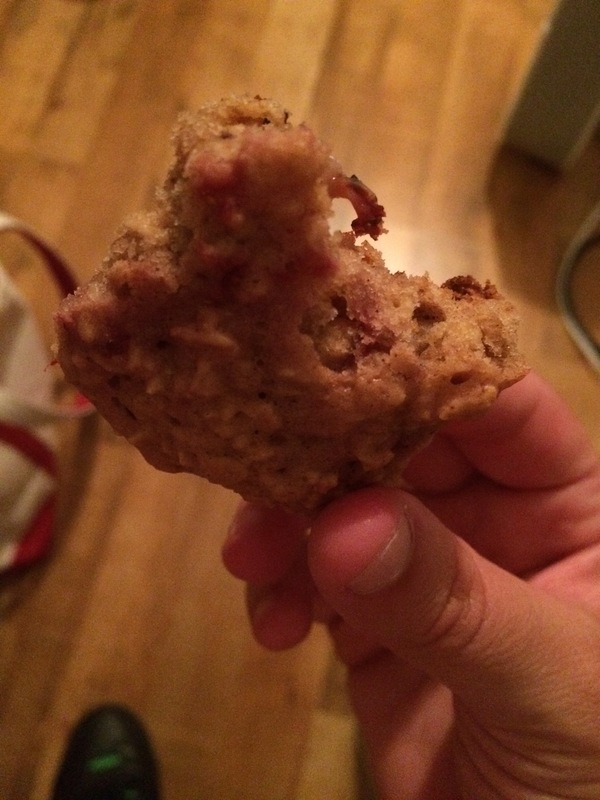 I found the recipe on the blog Amy’s Healthy Baking. As I skimmed her post and found the recipe and directions, I decided I had pretty much everything in the house to make these so it wasn’t going to be too much extra effort, except to turn the oven on. I followed her recipe, but instead of whole wheat flour I used all purpose. I don’t bake often so I wasn’t willing to buy more flour that had the potential to just sit around the pantry. I don’t think this affected the cookies overall though. They spread out pretty well and puffed up. A few things to highlight about this recipe, when she says to put it in the fridge for an hour, listen to her. I kept mine in for 2 because I was cleaning and it made it so easy to scoop and plop on the parchment paper. I don’t want to know what would happen if I didn’t let it thicken in the fridge. Parchment paper is your best friend. They came right off the paper and there was no mess on the tray. I’m all about an easy clean up. What extra items do you stock up in your freezer?